Tic Tac Trance #040 Replay available! 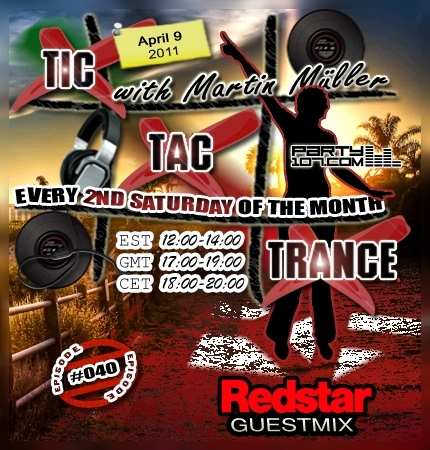 Better late than never, here’s finally the announcement for Tic Tac Trance #040 with special guest and friend Redstar! The 40th issue of my radioshow airs on April 9 @ Party107.com and creates a beachy and progressively atmosphere for the first hour. For the second half of the show Redstar takes over the control with his energetic and pumpin’ guestmix. Furthermore you can expect a nice collection of selected tunes of Redstar’s label Red Force Recordings. So don’t forget to tune in!